A little less than a year ago, I met one of my dad’s closest friends from high school. She said something that stuck with me. She said, the world is becoming flat. It’s true; as technology has advanced, the world has become more interconnected than ever. Mountains aren’t as tall as they once seemed, and oceans aren’t quite as vast. In Myanmar, I discovered a round world. Myanmar has avoided globalization just about as much as a country can due to the 50 year long dictatorship, and as a result the Burmese culture is still very much alive. We spent a lot of time on buses while traveling in Myanmar. Since tourism is just beginning to boom, most roads are not paved yet. Taking dirt roads through the mountains takes a little more time than one might expect, but that’s okay; the little bit of an itinerary we had got thrown out the window our first day in Myanmar, anyways. Our bus ride from Dawei to Hpa-An took about 10 hours (415 km/257 miles). This particular bus reminded me of an old school bus – seats were hard, and windows and doors stayed open for the entire ride as dust blew in. Legroom was limited since cases of beer were lining the floor of the entire bus, and because buses seem to be made for people under 5’2” putting even myself on the tall side of the spectrum. After a middle of the night transfer and a few hours waiting at the bus station in Mawlamyine, we arrived in Hpa-An! Although tourism in Hpa-An has grown quite a bit in the last few years, it still isn’t on the main tourist circuit in Myanmar. There isn’t much to see in the actual city of Hpa-An, but the surrounding areas were beautiful. We walked out of the actual city and found ourselves in farm fields and walking along dusty dirt roads. Women were cooking in large pots in front of their homes and when we stopped to see what it was, one lady gave us some to try. I still have no idea what it was, but once again the generosity of people in Myanmar brought a smile to my face. The second day we spent in Hpa-An we decided to take a tour our guesthouse offered. We spent 10 hours jumping in and out of the back of a tuk-tuk, exploring the region. From rice paddies, to lakes, to temple caves, the landscape in the region didn't cease to amaze me. Around every corner and at the end of every bumpy road there was something beautiful to see. Finally, we ended the day by watching the sunset at the "bat cave." Thousands of bats fly out of the cave; it looked like a slithering snake in the sky. After another night in Hpa-An and trading travel tips with a few other backpackers, we grabbed a bus to Yangon. Most bus stations in Myanmar are out of the city, so we had to take yet another bus into the actual city center. Finding bus number 43, was easier said than done since most buses are only marked with Burmese numerals. After a little help from the guidebook (and trying to learn Burmese numerals), we found it and were on our way! Arriving in Yangon (formerly called Rangoon) felt a bit like I stepped into a time warp. The English influence could be seen when looking at the architecture, but much of the city was run down. In all honesty, I found the city to be dirty and ugly. I could tell it was once a thriving city. In the 1920s Yangon held promise to become a cultural hub in SE Asia, however decades of military rule and oppression changed everything. Traveling has taught me that I don’t need to love everywhere I visit. I didn’t like Yangon, but I’m glad we visited. It was a city of contrasts; pagodas covered in gold leaves glimmering in the bright sunlight were not more than 100 feet away from roads (or what used to be roads) filled with trash. 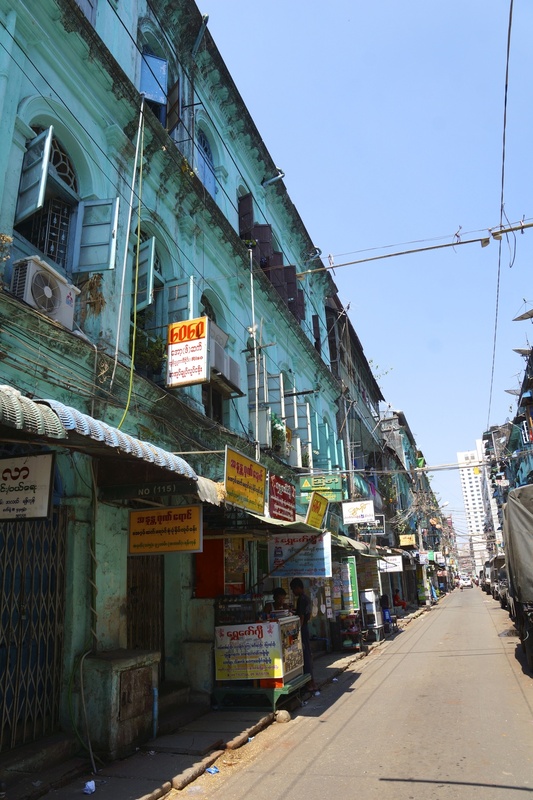 Differences between generations were also very much present in Yangon, from the way people dress, to the way they interact with people from other cultures, to the way they view education. I found the younger generation in Yangon to be a generation looking for change. When we took bus number 43 into the city, we talked with a teenage boy. He was curious about where we came from and eager to practice his English. He wore jeans and a t-shirt; many men in Myanmar still where longyis. He was curious to learn about the world outside of Myanmar and we were curious to learn about the Myanmar he had grown up in – a country undergoing rapid development, yet a country that is still very much influenced by the military. However, it was clear he couldn’t say much about the government or politics of the country in public. Protests are not something of the past in Yangon, or Myanmar in general. We left Myanmar about a week ago; since then another riot has taken place not far from Yangon. Students arrived and began “protesting against a new education bill which they say restricts their academic freedom” (BBC News). Many students were injured and arrested. Sadly, I wasn’t surprised when I read the article, but it’s left me wondering what will happen in Myanmar in the next few years. To learn more about the history of Myanmar click here (BBC Timeline). If you’re interested in learning more Aung San Suu Kyi, a Burmese opposition leader and winner of 1991 Nobel Peace Prize, consider watching “The Lady,” a film that tells the story of her life.